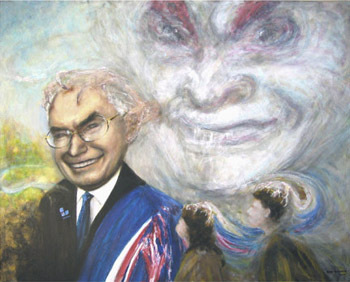 "This painting questions John Howard's fitness to serve. It is not about evil. It's not about the bible. It's about John Howard purposely allowing himself to be susceptible to forces of negativity." "People need to see this image. It shows the whole picture of a leader. We have to learn to look beyond clever words. This picture shows what is really going on - not all the time, but far, far too many times John Howard has chosen to open himself to forces that would do our nation harm. It is not meant to hurt Mr Howard. This should do him some good. Hopefully he will see, finally, that the office of prime minister has been so denigrated that the best thing for him, now, is to leave quietly, and to look instead to his own well being." "I wish you well, Mr Howard. Should you want to continue misleading, Sir, I give you this painting, your mirror." "From our country's point of view, this painting is a sign of a country gone too far. It should never have had to have been done. Many of our most decorated citizens have spoken up against Mr Howard's choices, and he has chosen not to listen. This is my humble shot at it, given in the hope that he might see." "It is about choices, Mr Howard." "And you will notice, Mr Howard, that this is not a personal attack on you. Have I captured your smile, Sir? Isn't this how you look? Rather, I have given a more complete picture, and as different from a personal attack, this is the more fulfilling." "Australia is a nation of greatness, of joy, of beauty, of freedom and of goodwill. Words cannot express how inspired I would have been to have given a painting that showed a leader in genuine full flight, a leader who had taken it upon himself to celebrate our true Australian qualities. A leader who had chosen to grasp his time in office as one of tremendous opportunity and excitement, time given him as a gift from the people, and with that time chosen to nurture our country's vast, deep and colourful majesty. A leader who would cherish our goodwill, and to walk side by side with us as we all shared our nation's greatness with the willing world." "It is long overdue. It had to be done." The silent majority will vote John Howard in again this year.Who else can we trust to govern this country and give us the life style we love.